Berberine (BBR) is a drug with multiple effects on cellular energy metabolism. The present study explored answers to the question of which CYP450 (Cytochrome P450) isoenzymes execute the phase-I transformation for BBR, and what are the bioactivities of its metabolites on energy pathways. BBR metabolites were detected using LC-MS/MS. Computer-assistant docking technology as well as bioassays with recombinant CYP450s were employed to identify CYP450 isoenzymes responsible for BBR phase-I transformation. 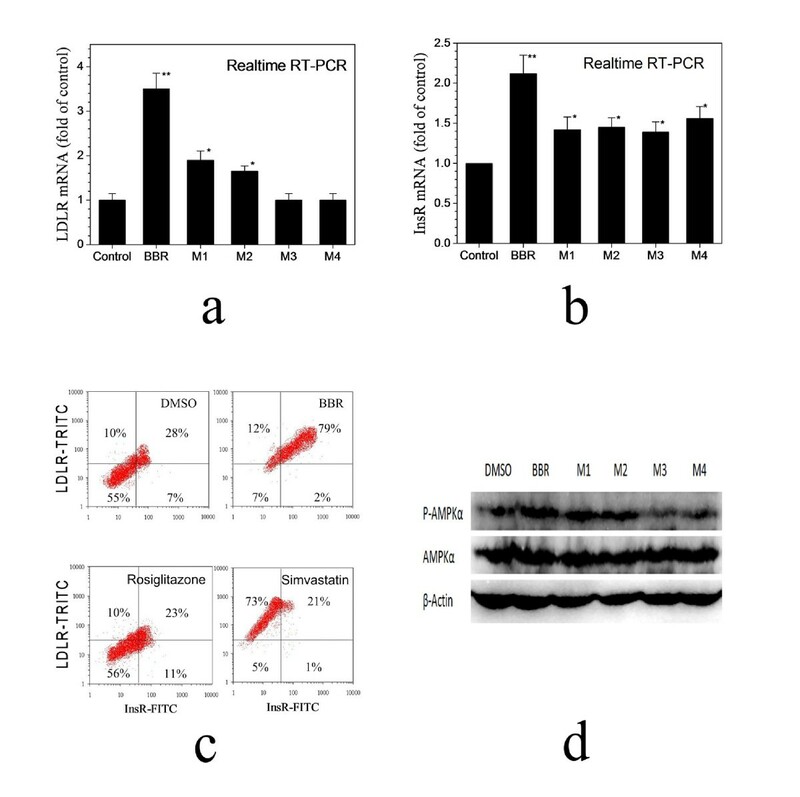 Bioactivities of BBR metabolites in liver cells were examined with real time RT-PCR and kinase phosphorylation assay. In rat experiments, 4 major metabolites of BBR, berberrubine (M1), thalifendine (M2), demethyleneberberine (M3) and jatrorrhizine (M4) were identified in rat's livers using LC-MS/MS (liquid chromatography-tandem mass spectrometry). In the cell-free transformation reactions, M2 and M3 were detectable after incubating BBR with rCYP450s or human liver microsomes; however, M1 and M4 were below detective level. CYP2D6 and CYP1A2 played a major role in transforming BBR into M2; CYP2D6, CYP1A2 and CYP3A4 were for M3 production. The hepatocyte culture showed that BBR was active in enhancing the expression of insulin receptor (InsR) and low-density-lipoprotein receptor (LDLR) mRNA, as well as in activating AMP-activated protein kinase (AMPK). BBR's metabolites, M1-M4, remained to be active in up-regulating InsR expression with a potency reduced by 50-70%; LDLR mRNA was increased only by M1 or M2 (but not M3 and M4) with an activity level 35% or 26% of that of BBR, respectively. Similarly, AMPK-α phosphorylation was enhanced by M1 and M2 only, with a degree less than that of BBR. Four major BBR metabolites (M1-M4) were identified after phase-I transformation in rat liver. Cell-free reactions showed that CYP2D6, CYP1A2 and CYP3A4 seemed to be the dominant CYP450 isoenzymes transforming BBR into its metabolites M2 and M3. BBR's metabolites remained to be active on BBR's targets (InsR, LDLR, and AMPK) but with reduced potency. Berberine (BBR, Figure 1) is a natural compound isolated from Coptis chinensis and is for decades an over-the-count medicine in China for diarrhea . Recently, accumulated research has identified BBR to be an effective drug in treating hyperlipidemia as well as hyperglycemia [2–4]. Clinical studies showed that oral administration of BBR caused significant reduction of blood cholesterol, triglyceride as well as glucose in patients with hyperlipidemia and type 2 diabetes [2, 3, 5–7], with no side-effects on liver, kidney and muscle [2, 5]. Mechanism studies have identified several important modes of action involved in the activities of BBR. The cholesterol-lowering effect was associated with extracellular-signal-regulated kinase (ERK) mediated LDLR mRNA up-regulation [2, 8]; the glucose-lowering effect mainly resulted from the protein kinase C (PKC) mediated InsR expression and the activation of AMPK [3, 4, 9, 10]. The observed reduction of triglyceride by BBR might reflect its synergistic effect on both sugar and lipid metabolism [2–4]. Chemical structure of berberine and its metabolites, berberrubine (M1), thalifendine (M2), demethyleneberberine (M3) and jatrorrhizine (M4). At least 4 major metabolites of BBR have been identified in human blood after Phase I metabolism ; however, human CYP450 isoenzymes that are responsible for BBR phase-I transformation remain to be identified. 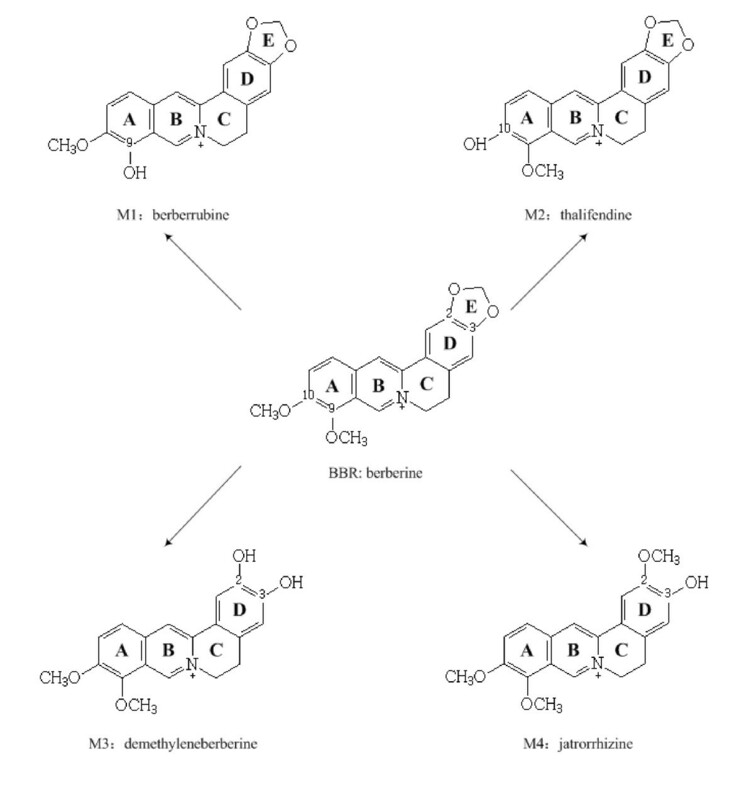 Furthermore, bioactivities of the metabolites on the pathways mentioned above are also unknown. As most of our previous experiments for BBR were done in CYP450 positive human hepatocytes, HepG2 and Bel-7402 [2–4], we were curious to learn which of the CYP450 isoenzymes are involved in BBR phase-I metabolism, and what are the bioactivities of the BBR metabolites. Answers to these questions might be important for patient selection in BBR clinical treatment as well as for chemical modification on BBR. Berberine (BBR) chloride (purity, 98%) was obtained from Sigma Chemical Co. (St. Louis, MO, USA). Berberrubine (M1), thalifendine (M2) and demethyleneberberine (M3) were synthesized by Chemical Department of our institute. All of the study compounds were in purity over 98.5%. Jatrorrhizine (purity, 98%) (M4) was purchased from the National Institute for the Control of Pharmaceutical and Biological Products (Beijing, China). The CYP450 inhibitors α-naphthoflavone, quinidine and ketoconazole were from J&K Chemical Ltd (Beijing, China). HPLC-grade acetonitrile and methanol were obtained from Fisher Scientific (New Jersey, USA). Pooled mixture of liver microsomes (Gentest Lot No. 70196, USA) and a NADPH-regenerating system were purchased from BD Gentest (Woburn, MA, USA). Microsomes from cDNA-transfected baculovirus-insect cells (expressing CYP1A2, CYP2A6, CYP2B6, CYP2C9, CYP2C19, CYP2D6, CYP2E1, CYP3A4 and CYP3A5) were also from the BD Gentest. Male Wistar rats (200-240 g, 8-week-old) purchased from Vital River Laboratories (Beijing, China) fasted overnight and were free access to water before drug administration. Rats were treated with with BBR orally (200 mg/kg weight, n = 8) or distilled water as negative controls (n = 3), and rat livers were removed 3 hrs later. 2 g of the liver sample was washed with 5 mL normal saline, cut into small pieces and extracted with 3-fold volume acetonitrile. After vortexed for 3 min, the extract was centrifuged at 16000 g for 15 min at 4°C and the supernatant was diluted with 0.2% acetic acid. Ten microlitre dilution aliquot was injected into the LC-MS/MS system for analysis. The crystal structures of the six CYP450 isoforms were retrieved from the Protein Data Bank (PDB ID code 2HI4 for CYP1A2, solved at 1.95-Å resolution ; 1Z11 for CYP2A6, 2.05-Å ; 1OG5 for CYP2C9, 2.55-Å ; 2F9Q for CYP2D6, 3.00-Å ; 3E4E for CYP2E1, 2.60-Å ; 1TQN for CYP3A4, 2.05-Å [17, 18]). In this study, the docking was based on steric considerations but orienting the substrate recognition sites (SRSs) toward heme and ferryl oxygen of CYP450 protein [19, 20]. A docking program FlexX (SYBYL 7.3, Tripos Inc) that uses an incremental construction algorithm was applied to optimize the interaction between the ligands and the substrate binding sites . As for each of the CYP450 proteins, all crystal water molecules were removed from the original structure, hydrogen was added using Biopolymer module in SYBYL. Incubation conditions were optimized to ensure the linearity with respect to the microsomal protein concentration and incubation time [22–24]. A typical incubation contained 0.1 mg of human liver microsomes, 100 mM phosphate buffer (pH 7.4), BBR (dissolved in methanol, final volume of methanol < 0.1% ) and NADPH-regenerating system (at final concentration of 3.3 mM glucose-6-phosphate, 1.3 mM NADP+, 0.4 unit/ml glucose-6-phosphate dehydrogenase and 3.3 mM MgCl2) in a final volume of 200 μl. After pre-incubation of HLMs with BBR for 5 min at 37°C, the reaction was initiated by addition of NADPH-regenerating system. After incubation of the mixture in a 37°C water bath with opening to the air, the reaction lasted for 30 min and was terminated by addition of 800 μl cold acetonitrile. Internal standard (40 μg/ml ampicillin, dissolved in acetonitrile) was added into the mixture, and then centrifuged at 16000 g for 15 min at 4°C. The supernatant was aspirated, followed by dilution in 0.2% acetic acid. 10 μl of the aliquot was injected into the LC-MS/MS system for analysis. Control samples were incubated without NADPH. The incubation was performed in duplicates. The experiment was performed with the condition described in the method using HLMs for transformation. 50 pmol/mL of each of the CYP450 isoenzymes incubated with 20 μmol/L BBR. Control microsome prepared from insect cells, which were infected with wild-type baculovirus, severed as a negative control. The incubation was performed in duplicates. α-Naphthoflavone  (typical inhibitor of CYP1A2; final concentration used, 5 μM), quinidine [27, 28] (typical inhibitor of CYP2D6; final concentration, 5 μM) sulfaphenazole  (typical inhibitor of CYP2C9; final concentration, 5 μM), troglitazone  (typical inhibitor of CYP2C19; final concentration, 5 μM) and ketoconazole  (typical inhibitor of CYP3A; final concentration, 5 μM) were added, respectively, to the incubation reaction containing 0.5 mg/ml HLMs, 100 mM phosphate buffer (pH 7.4) and NADPH-regenerating system at a final volume of 200 μl. Before addition of BBR (15 μM), the samples were pre-incubated for 10 min at 37°C and transferred onto ice for 45 min. The mixture was incubated at 37°C for 30 min and then terminated with cold acetonitrile . Sample analysis was described above. The incubations were performed in duplicates. To measure the enzyme kinetic parameters both in HLMs and rCYP450s, we adjusted the standard incubation mixture containing BBR at a final concentration between 0.15~75 μM. Incubation conditions were as described above. Samples were analyzed by LC-MS/MS. The kinetic parameters Vmax and Km were calculated using EK1 v10.0 program (SPSS Inc., Chicago, IL, USA), and these values were used to calculate the intrinsic clearance (Clint, Vmax/Km). The results were expressed as mean ± sd from three independent experiemnts. The percentage of total normalized rate (%TNR) was calculated to estimate the contribution of each CYP450 in BBR transformation . Sample analysis was performed using an LC-MS/MS system (Thermo-Finnigan, San Jose, CA, USA), which consisted of a Surveyor LC pump with an on-line degasser, a Surveyor autosampler and a TSQ Quantum triple-quadrupole mass spectrometer equipped with an ESI probe. A Waters XTerra® MS C18 (2.1 ×50 mm, 3.5 μm) column (Milford, MA, USA) was used for separation at 25°C. The mobile phase consisted of 0.2% acetic acid in water (A) and 100% acetonitrile (B). The flow-rate was 0.2 ml/min. In gradient elution, the proportion of acetonitrile (B) was linearly increased from 10% to 100% in 18 min, held at 100% for 2 min and returned to 10% in 0.1 min. The column was allowed to equilibrate for 10 min after each run. Only the data from 2 min to 15 min was acquired by MS. The MS was operated in positive ESI mode. Nitrogen was used as both the sheath and auxiliary gas at a pressure of 35 and 10 arbitrary units, respectively. The spray voltage was set at 4.0 kV and the capillary temperature was at 270°C. Full scan and product ion mass spectra results of BBR as well as M1-M4 were obtained (data are not shown). The most abundant product ion of each chemical was chosen for selected reaction monitoring (SRM). The SRM transitions and collision energies are shown in Table 1. Data were analyzed by Xcalibur 1.2 software. The Human hepatoma cell line HepG2 was obtained from the American Tissue Culture Collection (ATCC, USA). HepG2 cells were grown in Eagle's Minimum Essential Medium (GIBCO) supplemented with 10% fetal bovine serum (GIBCO), 1% non-essential amino acids (GIBCO) and 1% antibiotics (100 units/ml of penicillin and 100 μg/ml of streptomycin), and incubated at 37°C in a humidified atmosphere with 5% CO2. For real time RT-PCR and double immune-staining analysis, HepG2 cells were starved in Eagle's MEM supplemented with 0.5% FBS overnight and treated with BBR or its metabolites (M1-M4) for 8 hrs, respectively. For immunoblot assay, cells were starved in serum-free medium overnight and treated with BBR or its metabolites (M1-M4) for 24 hrs. The study compounds were diluted in culture medium prior to use. Total cellular RNAs were isolated by the Ultraspec RNA lysis solution (Biotecxs Laboratory, Houston, TX) by following the vender's instruction. Total RNAs were reversely transcribed into cDNAs using the Reverse Transcription System (Promega, Madison, WI). Quantitative real time PCR was performed with these cDNAs as described previously , with β-Actin as an internal control. Normalized InsR or LDLR mRNA expression levels were plotted as fold of the untreated control. The primers used were described previously [2, 3]. HepG2 cells were treated with BBR (27 μM), simvastatin (1 μM) or rosiglitazone (10 μM) for 8 hrs, respectively. The cells were harvested, washed in PBS and incubated for 1 hr at 37°C in the presence of both monoclonal antibody to InsR (Labvision/NeoMarkers, Fremont, CA) and rabbit polyclonal antibody against LDLR (Santa Cruz Biotechnology, Santa Cruz, CA). The corresponding isotype-matched, nonspecific mouse and rabbit IgGs were used respectively as controls for nonspecific staining. After washing in PBS, cells were stained with a fluorescein isothiocyanate (FITC)-conjugated goat anti-mouse IgG (green color, Santa Cruz Biotechnology), as well as a tetramethyl rhodamine isothiocyanate (TRITC)-conjugated goat anti-rabbit IgG (red color, Santa Cruz Biotechnology). The fluorescence intensities were analyzed in a FACS (FACSort, Becton Dickinson). Sample cells were rinsed with phosphate-buffered saline and lysed in SDS-PAGE loading buffer. Cell lysates were subjected to 8% SDS-PAGE for protein separation, and protein bands were transferred onto polyvinylidene difluoride membranes (Millipore). The amount of protein and extent of phosphorylation were estimated using the following primary rabbit antibodies, anti-phospho-AMPK-α-Thr-172 antibody, anti-AMPK-α antibody as well as anti-β-actin antibody (Cell signaling Technology, USA). The secondary antibody was peroxidase-conjugated goat anti-rabbit antibody (Cell signaling Technology, USA). After binding, the bands were revealed with enhanced chemiluminescence using the ECL commercial kit (Millipore). Differences of mean results among study groups were examined by a two-tailed unpaired Student's t-test for equal or unequal variances depending on a preliminary F test for homogeneity of variance. Results are expressed as the means ± sd. P < 0.05 was considered significant. It has been documented that BBR has four major metabolites after phase I metabolism in vivo, berberrubine (M1), thalifendine (M2), demethyleneberberine (M3) and jatrorrhizine (M4) . The chemical structures of the four compounds are shown in Figure 1. These metabolites were detectable in the blood and urine in human and rodents [11, 31]. The biotransformation of BBR in rats was reported to be similar to that in human . As BBR's activity was examined in hepatocytes in our previous experiments [2–4], we detected the BBR metabolites in rat liver to address the question of whether hepatocytes contain these metabolized products. 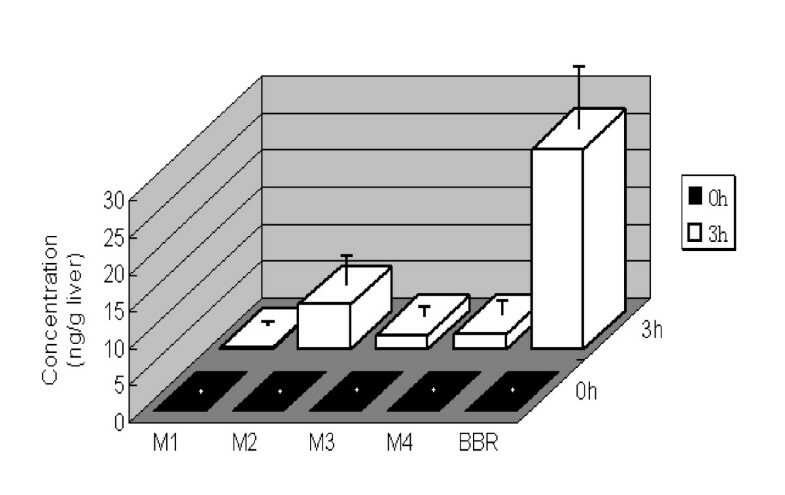 In the present study, the 4 metabolites M1, M2, M3 and M4 were all detectable in rat livers 3 hrs after BBR oral administration (Figure 2). The highest level was seen in M2 and the lowest in M1. The result was consistent with the previous reports of BBR metabolites in rodent blood [11, 31]. BBR and its main phase-I metabolites in rat liver. Male Wistar rats (200-240 g, 8-week-old) were orally treated with BBR (200 mg/kg). Rat livers (n = 8) were removed 3 hrs later, followed by homogenization, cell lysate extraction and LC MS/MS detection. Presented are mean and sd of the 8 rats. Untreated control rats (n = 8) were used for comparison. For BBR's metabolite formation in liver, our question was which of the CYP450 isoenzymes transform BBR into its metabolites. Thus, nine major recombinant human CYP450 isoenzymes (CYP1A2, CYP2A6, CYP2B6, CYP2C9, CYP2C19, CYP2D6, CYP2E1, CYP3A4 and CYP3A5) were investigated in this study. Of the nine isoenzymes, six (CYP1A2, CYP2A6, CYP2C9, CYP2D6, CYP2E1 and CYP3A4) have their 3-D structural database available from PDB (Protein Data Bank). As the initial step, computer-assistant docking analysis was performed using SYBYL 7.3 system for the affinity between BBR and each isoenzyme. As shown in Figure 3a for the docking score, the CYP2D6, CYP1A2 and CYP3A4 exhibited considerably good docking performance with respect to the positive docking cut-off value set at 5. The molecular interactions between BBR and the three CYP450s are shown in Figure 3b. BBR anchored in the binding site of CYP2D6 through hydrogen bond interaction with the side chain of Arg-221; Phe-120 played a major role in controlling the orientation of BBR to the heme; the Phe-483 made a cross lock to the C- and D-ring of BBR (Figure 3b, upper). The substrate binding cavity of CYP1A2 was uniformly narrow throughout its extent and was lined by residues Gly-316-Ala-317 and the Asp-320 peptide bond, which constituted a relatively planar substrate binding platform. Phe-226 produced another parallel substrate binding surface and a π-π stacking with BBR. In addition, both orthogonal and parallel aromatic interactions between BBR and residues Phe-125 and Phe-226 contributed to a tight binding affinity. Also, a water molecule of CYP1A2 hydrogen-bonding to BBR and Gly-316 strengthens this binding (Figure 3b, middle). In the BBR-CYP3A4 docking pattern, hydrogen bonding and orthogonal aromatic interactions were observed between BBR and the residues Thr-224 and Phe-57, respectively (Figure 3b, lower). The results suggest that the three cellular CYP450 isoenzymes might have good binding affinity to BBR. Identification of CYP450 isoenzymes that transform BBR into its metabolites. Interaction between CYP450 and BBR were analyzed with docking score generated from SYBYL 7.3 software analysis. CYP450 isoenzymes with docking scores over 5 were labelled with the score value (a). The 3-D structrual docking patterns between BBR and CYP2D6 (upper), or CYP1A2 (middle), or CYP3A4 (lower) were generated with SYBYL 7.3. BBR is rendered in sticks (red, oxygen atoms; white, carbon atoms; blue, nitrogen atoms). The heme prosthetic group is rendered in sticks in red. The amino acid residues constituting the active site cavity are in cyan, most of which are shown in lines. Amino acid residues rendered in sticks may help BBR binding to CYP450. Specific hydrogen bonds and a water molecule are showed as yellow broken lines and a red sphere, respectively (b). For the transformation test in rCYP450 isoenzymes reaction system, BBR (20 μM) was incubated with each of the rCYP450 isoenzymes (50 pmol/ml of rCYP450) for 0.5 hr, followed by a detection of the metabolites. The experiment was repeated twice (c). In the chemical inhibition assay, the α-naphthoflavone (ANF) was for CYP1A2 inhibition, quinidine (QND) for CYP2D6, ketoconazole (KET) for CYP3A, sulfaphenazole (SUP) for CYP2C9 and troglitazone (TGL) for CYP2C19. BBR was incubated with HLMs in the presence or absence of CYP450 specific inhibitors. The final concentration of BBR and the inhibitor in the reaction was 15 μM and 5 μM, respectively. The enzyme catalyzing activity of sample free of inhibitors (control) was defined as 100%. Presented is mean and sd of the percent of control (d). Then, the docking experiment was corroborated with biochemical assay. Each of the above-mentioned CYP450 isoenzymes was in turn incubated with BBR for 30 min, followed by detection of BBR metabolites with LC-MS/MS. The results are shown in Figure 3c. Treatment of BBR with CYP2D6 and CYP1A2 generated a considerable level of M2 and M3, suggesting that they were the dominant contributors to transform BBR into M2 and M3. CYP3A4 was also important for the production of M3 but only with a minor role in M2 production. In addition, CYP2C19, CYP2C9 and CYP3A5 showed some very weak effect in producing M2 and M3, respectively. CYP2A6, CYP2B6 and CYP2E1 were without effect on BBR transformation. Although the experiment was repeated for over 5 times, M1 and M4 were not detectable in the reaction system. If the results were true, inhibition of the CYP450 isoenzymes should reduce the formation of the metabolites. 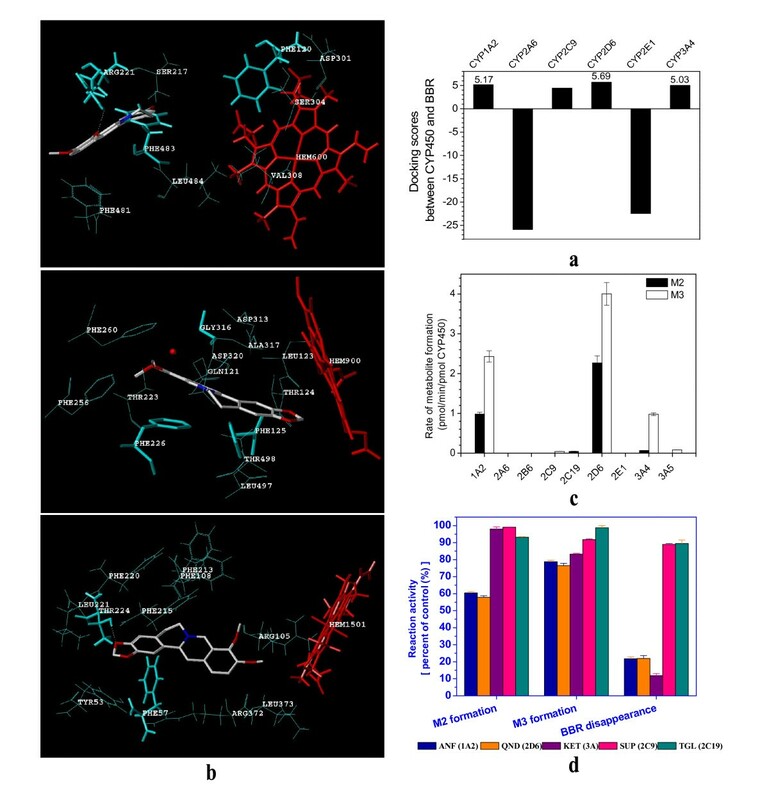 Therefore, chemical inhibition assays were carried out in the HLMs reaction system for the CYP2D6-, CYP1A2-, CYP3A-, CYP2C9-, or CYP2C19-mediated BBR transformation, respectively. BBR was treated with HLMs for 30 min in the presence or absence of specific CYP450 isoenzyme inhibitors. The effects of the inhibitors on BBR metabolism in HLMs reaction were shown in Figure 3d. The reaction activity of the control sample (with no inhibitor) was defined as 100% for the comparison with that of the samples treated with inhibitors. M2 formation was decreased by about 40% after ANF (for CYP1A2) or QND (for CYP2D6) treatment, but not KET treatment (for CYP3A); M3 formation decreased by around 20% after treatment with inhibitor for CYP1A2, or CYP2D6, or CYP3A; inhibitors for CYP2C9 and CYP2C19 showed only minor or no effect. Accordingly, BBR disappearance was found decreased in the reactions treated with inhibitors for CYP1A2, CYP2D6 and CYP3A, but not with those for CYP2C9 and CYP2C19. The sum of reduction in the formation of M2 and M3 were close to the reduction of berberine disappearance (Figure 3d). The results showed the role of the three CYP450 isoenzymes in the BBR phase-I metabolism, and were consistent with that from computer docking. The inhibition rate of each of the inhibitors for CYP1A2, CYP2D6 and CYP3A was in the range between 15-40%. The inhibitory efficacy of each of the inhibitors was not strong (especially for the inhibition of M3 formation), indicating a combined effect of the three major isoenzymes in BBR's transformation. Considering the relative expression of these CYP450 isoforms in liver, enzyme kinetic study using these CYP450 isoenzymes was performed and the relative contribution of each of the CYP450 isoenzymes was calculated. The results were in Table 2 and 3. For M2 production, the contribution rate of CYP1A2, CYP2D6 and CYP3A4 was 72.07%, 25.21% and 2.72%, respectively. For M3, the contribution rate was 26.36%, 37% and 36.63% for CYP1A2, CYP2D6 and CYP3A4, respectively. Next, each of the BBR metabolite compounds was examined for their effect on the expression of InsR and LDLR mRNA, as well as on the activity of AMPK in human hepatocytes. For LDLR mRNA expression, the original BBR remained to be the strongest up-regulator (Figure 4a); among the 4 metabolites, M1 and M2 remained to be active with an activity 35% and 26% of that of BBR, respectively; M3 and M4 were without effect. Although the 4 metabolites were active in increasing InsR mRNA level in HepG2 hepatocytes by around 1.5 folds, the original form of BBR appeared to be the most active one up-regulating InsR mRNA level by over 2 folds (Figure 4b). It suggests that BBR in its original form is the most potent functional compound for the hypoglycemic as well as lipid-lowering effect in clinic. To compare BBR's effect with the known type 2 diabetes drug rosiglitazone and anti-cholesterol drug simvastatin, double immune-staining was conducted for the cell-surface protein expression of InsR and LDLR. The results demonstrated an up-regulatory effect of BBR on both LDLR and InsR on the membrane of human hepatocytes, suggesting a unique effect of BBR on the two major molecules related to energy metabolism. In contrast, simvastatin increased LDLR expression only, but not InsR; and rosiglitazone showed effect on neither LDLR nor InsR (Figure 4c). The results hint an advantage of BBR over the known drugs in modulating cellular energy metabolism. Effect of BBR metabolites on InsR, LDLR and AMPK. HepG2 cells were respectively treated with the compounds for 8 hrs at concentration of 20 μM for InsR test or 40 μM for LDLR, followed by RNA extraction and real time RT-PCR assay for the InsR or LDLR mRNA. The amount of LDLR (a) and InsR (b) mRNA in the treated cells was normalized to that of the untreated control. * p < 0.05, **p < 0.01, vs the untreated control. To detect the protein expression, HepG2 cells were treated with BBR (27 μM) for 8 hrs, with simvastatin (1 μM) and rosiglitazone(10 μM) as references. Berberine increased the cell-surface expression of both InsR and LDLR in the hepatocytes (c). For AMPK activation, HepG2 cells were treated with the study compounds (20 μM) for 24 hrs with DMSO as a control. AMPK-alpha phosphorylation in the HepG2 cells was detected with immunoblots, using a protocol described in the Methods (d). AMPK's activity closely associates with sugar metabolism. Kim et al has reported that BBR reduced blood glucose through activation of AMPK in adipose cells . Here, we tested BBR metabolites for their activity on this kinase in liver cells. As shown in Figure 4d, among the study compounds BBR was again the most active compound for AMPK activation; the treatment of HepG2 human liver cells with M1 and M2 increased the activity of AMPK but with a less potency as compared to that of BBR; the effect of M3 and M4 on this kinase appeared to be not significant. The experiment was repeated for more than 3 times and the results were reproducible. As the BBR bioactivities were kept at certain degrees in the metabolites with an intact E ring (M1 and M2), but abolished in those with E ring opened (M3 and M4), the presence of E ring on BBR (Figure 1) seems to be essential for their activity on LDLR and AMPK, consistent with our previous observation . The analysis of the functional group of BBR has led us to a creation of an M1 pro-drug, which demonstrated an increased efficacy as compared with BBR . BBR is a safe medicine with multiple therapeutic effects. This compound has a poor absorption rate in human gut with less than 10% of BBR entering into blood stream . BBR were metabolized into at least four metabolites after phase-I metabolism in vivo. This study shows for the first time that CYP1A2, CYP2D6 and CYP3A4 are the major contributors for the transformation of BBR into its metabolites in human liver microsomes. The main metabolites detectable in the enzymatic reaction were M2 and M3; M1 and M4 were not found after incubation of BBR with recombinant CYP450s or the HLMs mixture. As the sensitivity of our LC-MS/MS test was in 100~500 pg range, the M1 and M4 content might be under this level in the reactions. Further optimization of the experimental condition might help us to identify these two metabolites although their concentration seemed to be extremely low in these reactions. It is worthy to note that statins are mainly metabolized under the action of CYP3A4 [35, 36], relatively different from that in BBR. The information might be helpful in designing clinical therapeutic regimen combining statins with BBR . Also, this study shows for the first time that although BBR itself is the most active compound to up-regulate InsR expression, all of its metabolites remain to be active at certain degree on this target. For LDLR up-regulation and AMPK activation, M1 and M2 are the two active metabolites, with reduced potency. The study suggests that the action of BBR on cellular energy metabolism pathways mainly originates from BBR in its original form. Taken together, four major BBR metabolites (M1-M4) were identified after phase-I transformation in rat liver. CYP1A2, CYP2D6 and CYP3A4 appeared to be the key enzymes to transform BBR into M2 and M3 in cell-free metabolism reactions. The metabolites of BBR remained to be active on InsR (by M1-4), LDLR (by M1 and M2), and AMPK (by M1 and M2), but with largely reduced potency. It appears that BBR in its original form is the active chemical entity that regulates multiple pathways in energy metabolism. Yi Li, Gang Ren contributed equally to this work. This work was supported by the National Natural Science Foundation of China (90913002) and the "National S&T Major Special Project on Major New Drug Innovation" (2009ZX09301-003). LY carried out the CYP450 metabolism study, computer-aided docking study, rat experiment and participated in writing of the manuscript; RG carried out the AMPK activity assay and participated in writing of the manuscript; KWJ carried out the LDLR and InSR expression analysis; YP, WYX and LYH did the synthesis and analysis of M1, M2 and M3; YH and LZR participated in the computer-aided design assay; JJD and SDQ designed and organized the studies, analysed data and wrote the manuscript. All of the authors read and approved the final manuscript.